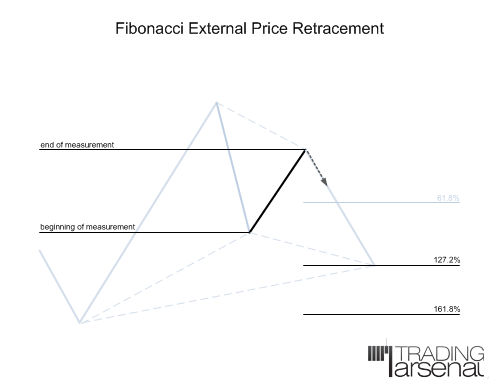 There are 4 types of common Fibonacci measurements in harmonic trading. Internal Retracements are retracements of less than 100%. This can be seen as a correction to the prior trend. Most common ratios for internal retracements - 38.2, 50, 61.8, 78.6%. An external retracement, since it is greater than 100% of the swing that is retraced, can be seen as part of new trend. Most common ratios for external retracements – 127, 161.8%. Price Projections (also called APP-alternative price projections) are measurements which compare swings in the same direction. They project trend swings with trend swings and corrections with corrections. We simply take low to high swing and project it from different point on the chart. Using combination of retracements, projections and extensions we can build a Fibonacci cluster also referred as Fibonacci confluence, convergence or Potential Reversal Zone. Closer and more lines from different measurements stronger PRZ, meaning higher probability it will work as support or resistance level and will allow a trader to enter into low risk and high probability trade. In practice we look for minimum 2 Fibonacci price relationships coming together with a relatively tight range. When a price enters the PRZ we expect that this area will stop the prior market move and act as Support or Resistance. We observe the price behavior at this level, a trigger that will tell us to enter the market. 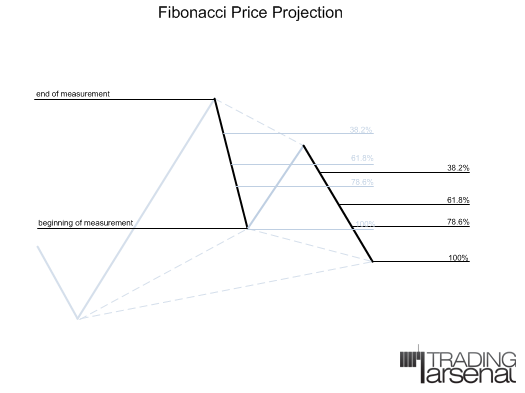 Similar to Fibonacci price measurements we work on Fibonacci time measurements. Time clustering will allow us to identify time when the price hit the support/resistance level and retrace. Last edited by kor4x; 09-02-2012 at 08:28 PM. 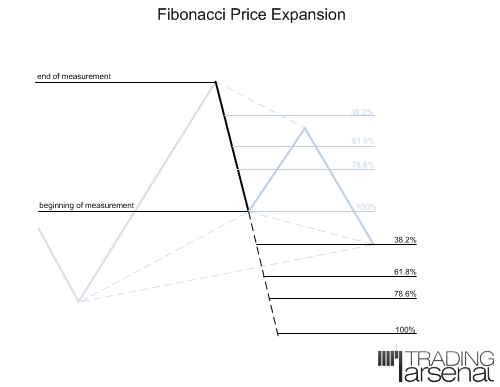 Fibonacci measurements and creation of the price and time clusters deserve a separate post. Trading would be too easy if by placing retracement, projection and expansion on the chart we would see them all clustering on 1 PRZ. No. Usually you will get number of clusters, number of potential levels where price will stop and retrace. How to choose the right one? … hm, that is why you have other confirmation techniques. Note that very often in a books or articles you can see charts with marked PRZ, presenting just couple of lines, all meeting in very tight price level. Keep in mind that all the other lines were removed and chart most often prepared post factum. 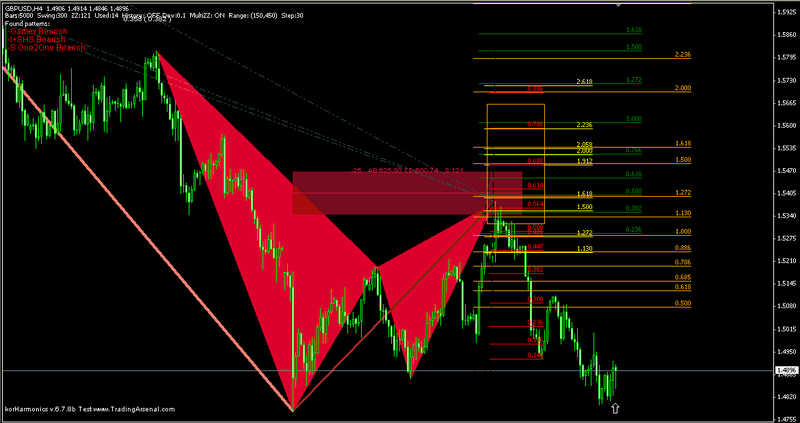 Picture below presents all measurements while looking for the potential Gartley pattern. The one where price turned was one of the candidates, but not the only one where clusters were visible. Note also that after sometime working with the method you will discover that some out of 4 measurements types are less reliable than the others. You will also decrease number of Fibonacci ratios you apply. Simplification comes with time. I am new to this Harmonic Trading Technique... I would like to ask am i right say that for Fibo Time, i can apply the " XA Internal Retracement, BC External Retracement, AB Alternative Projection or AB Expansion" as what i have did in the Fibo price?? Base on the MT4 Fibo Time Function, Each line was being measure by the Fibonacci Sequencing Numbers ( 0,1,1,2,3,5,8.... etc) instead of the retracement %.. Should i change it or i can use the default setting? 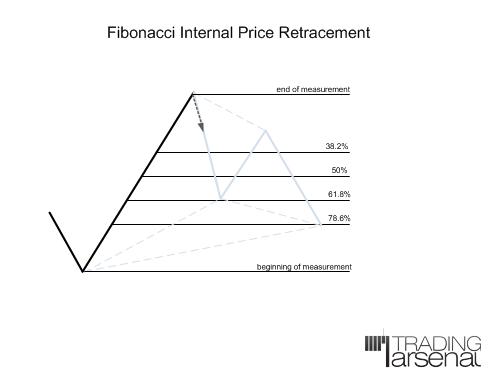 I am getting kinda confuse in the Fibonacci Price Retracement. Any help will be greatly appreciated. Could anyone tell me where I can learn more about "Fibo time" mentioned in the image above? Which books or threads or indicators do you use to get Fibo time projections?